Oh Dear. It Appears I Have The Collecting Bug. Both my parents are avid scary crazy dedicated antique collectors. While other dads enthusiastically came home with dead deer tied to the top of the car, my parents pulled into our driveway hollering about the late 19th century bonnet chests secured to the top of their Subaru wagon that they bought for a STEAL. My parents told my sister and I - at the time - they were collecting these pieces for US, for when we started our OWN homes and families. But years later, when we tried to collect on that promise, it was like prying a rope-toy out the the jaws of a pitbull: a little scary. I grew up in a house full of A LOT of antiques. The house was VERY ANTIQUE-Y. Imagine lots of chests of drawers, lots of inkwells, Longwy, sterling silver pen knives (sterling silver ANYTHING, really), relief molded jugs, oriental carpets, well-porportioned side tables, cranberry glass, and hopefully you get the picture. In a classic example of the apple falling not that far from the tree, sprouting feet, and RUNNING AWAY, I have always kept a spare home. I DIDN'T WANT STUFF. I didn't used to. But now I do. I may have a mid-century modern version of the collecting bug. I am in love - quite by accident? With Catherine Holm enamel dish ware. Particularly the platters and bowls. I didn't grow up with it, but my parents started the "collecting bug" shortly after I got married and moved out. of course, I got the bug as well. It's a lot of fun, but we have really pared down. It's also kind of weird when you go over to your parents house and they want you to pick out what you want when they die..... EWWW! Hilarious! I can just see the opl Suburu pulling up with furniture on top! My parents are the same... and I too, have the collection bug. I fear it is not limited to one thing though!! How COOL are those. I can see why you've been bitten by the collecting bug!! I was the same way, avoiding antiques because my mother was OBSESSED, but now find myself adding them to my home. Love your blog, stopped by from SITS, have a great week! 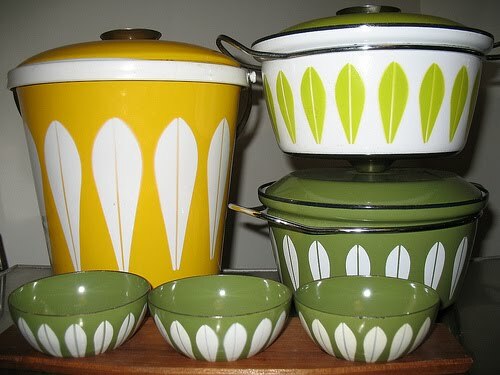 I so remember using those green bowls... every Friday night we used them for popcorn. Hey, you have an entire house to fill, a bit of collecting will be fun! At this point in my life, my collections are so special, lotsa of memories about how they arrived here... the people and places... nice. That story sounds familiar. I love thrift shops and unique places so that I can collect what I LOVE! 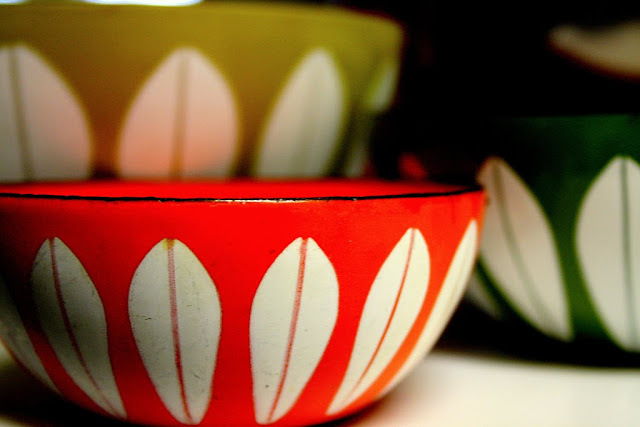 That enamel dishware is fantastic! Now I want some! Thanks for the follow...I will return the favor (if I was not already following). Oh wow- these are great. So pretty. Stopping by from SITS! These look some my grandmother had. Hmmmm. That IS a lovely bonnet chest - now if I just moved some things around in the living room . .. . . I am not much of a collector, but here lately it seems like a few things are starting to catch my eye. Like you I keep a pretty spare home. My parents had too much stuff and I did not want my kids to feel crowded like I did. Baskets seem to have caught my eye recently. All the sudden each room has at least one. Not sure how it happened, but it did. Enjoy your collecting. Oh dear, indeed. I have never seen those...and now, the girl who doesn't go in the kitchen unless necessary (me, and it's rarely necessary), wants to collect those too! It appears that you are, indeed a trendsetter. See the newest dwell magazine, last page! Not only that: I just happened to watch The Swimmer; a Burt Lancaster classic. There was an ice bucket in the movie that was the same design. Fashionable in 1968 and fashionable in 2010! Those bowls! I'm in love! OMG how lucky can a person be....parents are ANTIQUE DEALERS and COLLECTORS...oh my I would die and go to heaven. actually my mom did collect but i'm sure nothing like what you've experienced. i would love to renovate a house but everyone who's done it tells me it's an ORDEAL.